"Come what may, this is happiness...here for a moment I can experience perfection." Cries And Whispers joins The Seventh Seal, The Magic Flute and Autumn Sonata in the Criterion Collection, as they bring us the fourth installment in their series of films from Swedish director, Ingmar Bergman. Bergman's trademark are works which explore the inner workings of the human psyche, exposing the mental framework within which his characters live their lives, their beliefs, their fears and their relationships with each other and their eventual mortality. His are not pictures of intense action; the intensity comes from the depths with which Bergman is able to explore the solitudes inherent in human beings, their fragile coexistence with the world around them, and the results when some of the bonds which form stabilizing factors begin to break or are tested. 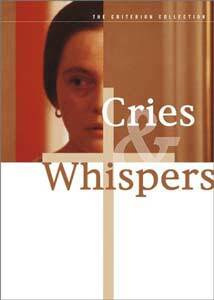 Bergman's second English language film, Cries and Whispers, examines the relationship between three sisters and the family maid, as they gather at the family estate for the last days of one sister's life. Agnes (Harriet Andersson), dying of cancer, awakes to find her sister Maria (Liv Ullmann, whose daughter with Bergman also appears in this film) asleep on the chair where she has been keeping vigil through the night. Along with her other sister Karin (Ingrid Thulin), and her maid Anna (Kari Sylwan), these remaining days have kept her in the company of those she loves. As we meet each of the women in this story, we are brought into their own thoughts and remembrances, and given a glimpse of some of the events which have brought them to this juncture in life, and defined their characters. Maria is an outgoing and self centered young woman, though her inherent beauty and emotional subsistence are both fleeting and shallow. Her older sibling Karin is bitter, reserved and isolated, harboring resentment from the past against those in her family. Agnes, though now suffering the excruciating pain and humility that comes from her condition, recounts her youth. Agnes appreciates the presence of her family, and especially her loyal servant Anna, who is dedicated to making her as comfortable and happy as possible through this time, while trying to remain strong in her own right under the pressure of the inevitable demise of one she holds extremely dear. As we journey through the minds of these women, we see the strengths and flaws in their being, and explore the fabric of love that ties the family together, yet also keeps it apart. Long stretches of silence, and a constant referral to the passage of time count down the hours to the death that they have all come to witness and reconcile with. It is a touching drama reaching into the inner depths of human emotion, and contemplating the imminent mortality that awaits us all. Though his screenplays for Smultronst�llet (Wild Strawberries - 1957) and S�som i en spegel (Through A Glass Darkly - 1961) had received recognition from the Academy, he was nominated for Best Director for Cries And Whispers which also became one of few foreign films ever nominated for Best Picture, though it ultimately lost both awards to George Roy Hill's The Sting. However, cinematographer Sven Nykvist did win the Oscar® for his striking camera work in this film, which contrasts light and dark almost as a metaphor for life and death. The color palate relies heavily on red, which dominate the interiors used exclusively throughout the picture, but the color also serves as the segue between each woman's individual introspection sequences. We see closeups of household objects, lifeless, then are shown closeups of the characters, also lifeless in their own ways. As we examine the features of each, we read into their faces the events in their past that have shaped them. One sequence features the family physician (Erland Josephson), who after examining her dying sister, studying the character developed in Maria's face, describing each line, and identifying the origins of these features, and how they have contributed to her being. It is a scene of self-examination that each of the characters will undergo through the course of the film, both physically and mentally. Cries And Whispers is a rich character study, balancing the realistic portrayal of a woman in the clutches of death with the dream-like state weaving past and present. Image Transfer Review: Image quality is generally very good throughout the picture, with only minimal use of edge enhancement. The color pallette is very warm, and transfers well, though I felt reds tended a bit too much towards orange at times, which I will qualify by saying not having seen the film before, I don't know whether this is correct or not. There is some minor solarizing in the rendering of the reds which form the segues. Detail is very good, despite the film's somewhat soft appearance. Contrast looks spot on, and the low level details from the predominantly natural lighting used in the film are not lost. This is a sumptuously visual film, and these minor issues aside, it stands up well. The aspect ratio looks a lot closer to 1.78:1 than the package's indicated 1.66:1. Audio Transfer Review: The Swedish audio track is clear and distortion free, with no signs of hiss. The soundtrack features long stretches of silence, broken only by clock ticking or chimes, and this detail is well presented. The English dub track has a similar quality, again reproducing the ambient nature of the sound design without unwanted hiss or distortion. Aside from differences in the voices, the background for these tracks seems a very close match. Extras Review: Once again Criterion has proven, at least to me, that the value of supplements to a film comes not in their number, but in their substance. Cries And Whispers featuresIngmar Bergman: Reflections on Life, Death and Love with Erland Josephson, a single 51-minute interview with director Ingmar Bergman and his longtime friend and colleague, Erland Josephson. Conducted by Malou von Sivers in 1999 for TV4 International Sweden, this insight into the lives and thoughts of these two gentlemen is a priceless addition to this disc, as they reflect on their relationships, families and their very different views on death. The discussion is candid, and not at all what I had expected from this piece�we have the words of men who have lived long and adventurous lives, yet are not afraid of discussing their failures or their heartbreaks. This feature has elevated my grading to recommended with its inclusion. Criterion has also included the dubbed English version of the film, and an essay by Peter Cowley on the production is included in the overleaf. With Cries And Whispers, Ingmar Bergman brings us a powerful film on our relationship with death, as seen through the eyes of four women. Each has their own way of dealing with the situation, and this exploration of human emotion and family bonding is presented in a somewhat surreal atmosphere, framed in lush cinematography. The pacing is slow, dialogue minimal, yet the film carries its message through exquisite visuals. Criterion's supplemental material is once again fitting for the film, and elevates this release to their usual higher standard. Recommended.